(1831-1905)Born in Bavaria in 1831, Straus immigrated to the U.S. at age 17. For a short while he lived in Ohio and in 1853 moved to St. Louis, MO where he obtained employment as a scene painter in the Old Pine Street Theater. After a few years in Mobile, AL and New Orleans, in 1872 he moved to Chicago where he painted scenery at Hooley’s Theater. In 1875 Straus settled in San Francisco and continued this line of work for Tom Maguire, proprietor of the Bush Street Theater, and for the Grand Opera House. In 1877 he abandoned theater work to devote full time to easel painting. Straus established a studio at 728 Montgomery Street and began making sketching trips to Yosemite, Marin County, the Monterey Peninsula, and Oregon. In 1890 he became a U.S. citizen and by that time was supporting himself with his paintings. 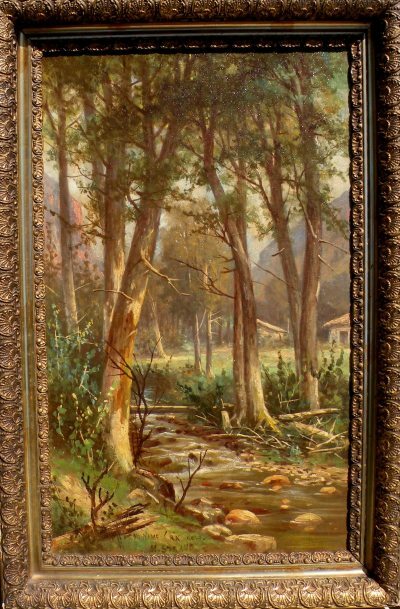 Although he painted still lifes, he is best known for his landscapes of Northern California. He died in San Francisco on March 11, 1905 at his home at 1604 Steiner Street. Member: Bohemian Club; San Francisco Art Association. Exhibited: SFAA Annuals; Mechanics’ Inst. Fairs; Bohemian Club. Awards: Honorable Mention, World’s Fair, New Orleans; Medal, California State Fair, 1891. Works Held: Oakland Museum; Society of California Pioneers; Sierra Nevada Museum, Reno.